“He seemed normal, laughing with his siblings, but doctors told us, ‘He’s like a switch. At any time, he can turn off,’” said TJ’s father, Marlon. “We were so overwhelmed,” said his mother, Divinia. The diagnosis, severe dilated cardiomyopathy, often strikes without warning or any apparent trigger. TJ needed a new heart, but he was too sick to wait for a heart transplant. “The wait time for a transplant was much longer than we could expect TJ to be stable,” said David Rosenthal, MD, a cardiologist at Lucile Packard Children’s Hospital Stanford. That’s why TJ immediately received a ventricular assist device, a pump surgically implanted in his heart to help it move blood through his body. At first, the Balliao family thought the pump would keep TJ alive only until a donor heart became available. But the VAD enabled him to recover so strongly that doctors gave him an unusual option: He could go home with his VAD and delay a transplant indefinitely. For TJ, a high school senior, this meant the opportunity to graduate with his class. 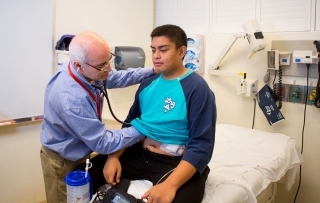 For his doctors, it represented a new avenue for treating children with heart failure. Although some adult heart-failure patients now live with VADs for months or years, children who get the pumps are usually transplanted as soon as possible. Rosenthal thinks TJ’s case could represent a change in thinking. Rosenthal’s forward-thinking approach to the devices continues a long tradition of leadership in VADs from his team at the hospital’s Heart Center. In 2004, the Stanford Children’s Health team was the first in the western United States to use a VAD to help a child survive until he could undergo a transplant: The team employed an early version of the device, a Berlin Heart, to help the infant live through a 55-day wait for a new heart. The Berlin Heart was large and cumbersome, requiring children to live in the hospital. In contrast, TJ has a portable VAD called a Heartware HVAD, with a messenger-bag-style battery pack he wears when he’s not near an electrical outlet. “It’s cool: It tells me when it needs me,” TJ said. “It beeps to remind me to change the battery every six to eight hours.” He numbered the machine’s four batteries to ensure that he’s always charging and using them in a strict rotation, one of many tips he received from Jenna Murray, RN, the hospital’s VAD coordinator. Although life with the VAD comes with restrictions — no swimming, for instance — it’s a huge improvement over the early days of TJ’s illness, when his failing heart confined him to the hospital. “TJ is pretty adaptable,” said Rosenthal. After the teen’s June graduation, the medical team and the Balliao family will assess the next steps. TJ has been accepted to San Jose State University to study civil engineering, so he may be sitting in introductory engineering classes next fall with his trusty Heartware battery pack at his side. Perhaps he’ll eventually receive a newer VAD that has an internal power source to free him from his 24-hour tether to a battery or wall outlet. Such devices, Rosenthal said, are not far off.